Using Blogsphere? Use Windows Live Writer to write blogs! I have been using the amazing Blogsphere template by Declan Lynch for a while now, and boy am I impressed! Here the other day I was looking for a way to let my friends add blogs to a common blog of ours. First I was thinking about ordinary web editing, without the need to install anything. Whilst web-editing is on the way in future versions of Blogsphere, we're not quite there yet. The other options included e-mail (!) 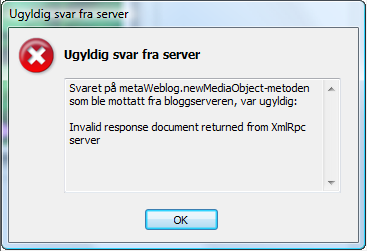 and something called MetaWebLog API. Additionally the biggest problem with the e-mail interface is that you don't see what your blog-entry will look like until you actually e-mail the blog-entry. Another issue is of course all the possibilties for error. One small mistake in the above tags, and the post may go haywire! Then I discovered that Blogsphere has code to support both the Blogger API and the newer MetaWebLog API. After googling around I found that several nice looking clients exists, such as from Wordpress or .... Microsoft... yup, the cleanest and most nice looking in my eyes where Windows Live Writer (WLW). I downloaded the installer and started to configure WLW. Specify the homepage of your blog, your username and password (both kept in the User Profile in Blogsphere), and WLW initiated communication with my blog. Looked like a lot of back-and-forth messages between my blog and WLW!! After a short while, I was opted to post a temporarily message to retrieve even more information about my blog, so that I did. After approximately 1 minute, WLW was finished, and I could - WITHOUT HASSLE AT ALL - post my first small blog entry!! Amazing! Since I had already volunteered to add some code snippets to Blogsphere, I took a quick dive into the Java-agent responsible for the MetaWebLog processing. I quickly discovered that the code had an issue with the Request_Content-field. From the Lotus Knowledgebase Technote #1240370 (titled "Using REQUEST_CONTENT with Web agents and large POST data") you learn that Domino 7 and onwards lifts an old limit of 64 kB by introducing multiple Request_Content_nnn fields, such as Request_Content_000, Request_Content_001 and so forth. I am not that fluent in Java, I was able to quickly assemble some code to retrieve the values of all Request_Content_nnn fields. Voila - that worked!! I could instantly post large images, tables and files with WLW after that!! Amazing! I believe that WLW has really lowered the bar for new users to blogging, and I am very eager to learn what my friends think of WLW! I'll keep you updated! PS! Did I mention that WLW easily can connect to several Blogs! Cool! 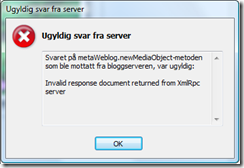 How to ensure inline HTML in Blogsphere works! This normally works quite good, when I tried to leverage some form-based code, everything went bananas! The trick was to ensure that the inline HTML code is on a single line!